Rising stock: Zee? Entertainment ?Enterprises? chairman? 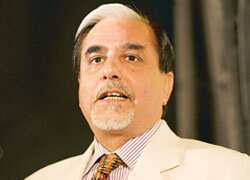 Subhash Chandra. Mumbai: Officials of India’s top listed media firm, Zee Entertainment Enterprises Ltd, said on Tuesday that its second quarter profit more than quadrupled on higher revenues from advertising and subscriptions, sending its shares up by more than 8%. Zee Entertainment, which trails News Corp.’s Star India, said consolidated net profit for the September quarter jumped to Rs97.1 crore, from Rs21 crore in the year-ago period. Consolidated revenues rose 14% to Rs399 crore, with advertisement revenue up 28% at Rs220 crore and subscription revenue rising 10% to Rs160 crore compared with the year-ago period. Advertising made up 55% of Zee’s overall revenues in the September quarter, compared with 49% a year earlier, while subscription made up 41%— down from 42%. Revenue from its direct-to-home satellite service Dish TV, which has about two million subscribers, was Rs12.5 crore. Company officials said revenue from its sports business was Rs42.2 crore in the quarter and turned an operating profit, compared with a loss in the previous quarter. Zee will launch the Indian Cricket League and relaunch the National Football League in the second half of the fiscal year to March 2008, it said. The company has pipped Sony Entertainment Television with new programming, and its flagship Zee TV Hindi-language entertainment channel had an average viewership share of 30% in the quarter—up from 25% in the previous quarter. Shares in Zee rose as much as 8.1% to Rs345 in a firm market on Tuesday, valuing the firm at $3.8 billion (Rs15,086 crore). Zee’s share closed at Rs338.75 on the Bombay Stock Exchange (BSE), up 6.1%. The shares, which rose 15% in the September quarter, trailing an 18% gain for the BSE benchmark Sensex, traded at 42.7 times forecast earnings, compared with 32.6 times for regional language broadcaster Sun TV Ltd.